• Globally, over half of football fans (54%) have witnessed racist abuse while watching a football game. Only 28% would know how to appropriately report such racist incidents. • In the UK, more than half of fans have witnessed racist abuse (50%), but less than half would know how to report it (40%). In the US, these figures are 51% and 28% respectively. 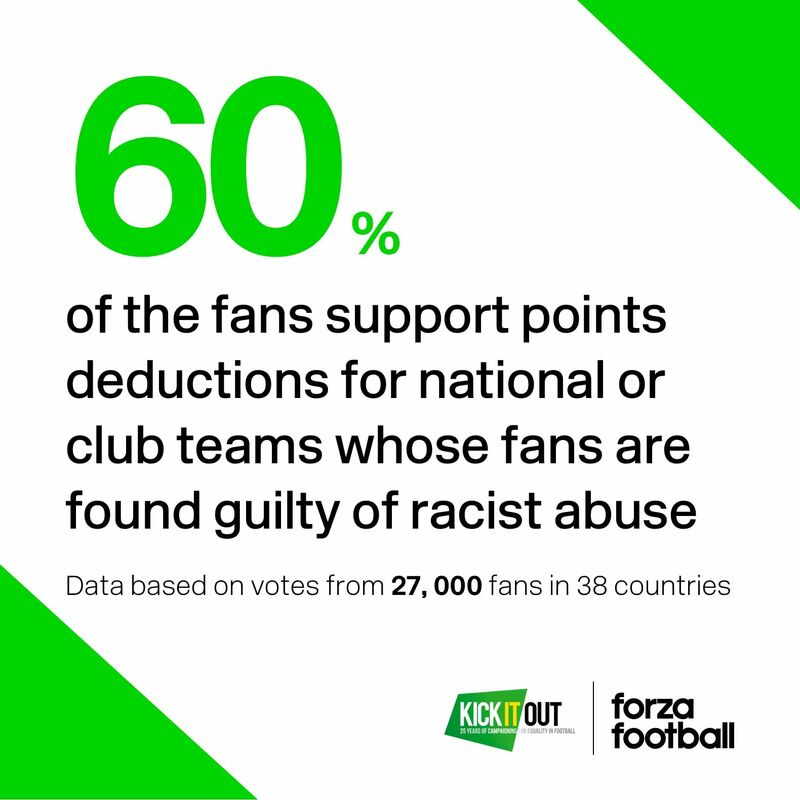 • 60% of fans internationally would support points deductions for national or club teams whose fans are found guilty of racist abuse (for example, Chelsea having points deducted following their game in Paris in 2015). 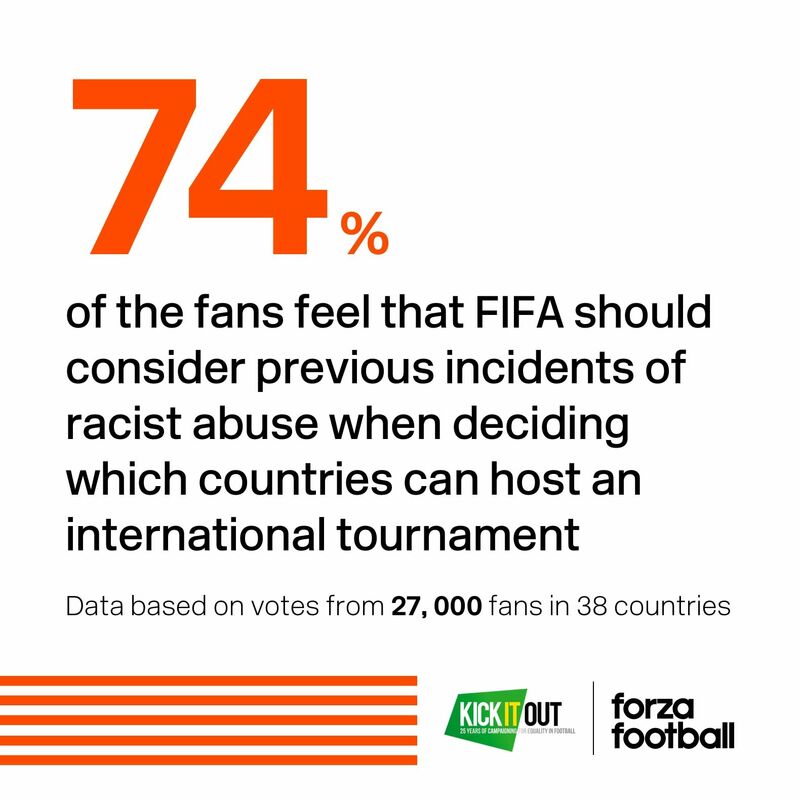 • Globally, 74% of fans want FIFA to consider previous racist abuse when awarding countries international tournaments. The hosts of the 2026 World Cup are in agreement, with 77% of Americans wanting this, 76% of Mexicans, and 77% of Canadians. • In Middle Eastern countries, 80% of fans support this view too. However, problematically ahead of the Qatar World Cup 2022, only 13% of fans from Arabic countries would know how to report incidents of racist abuse. 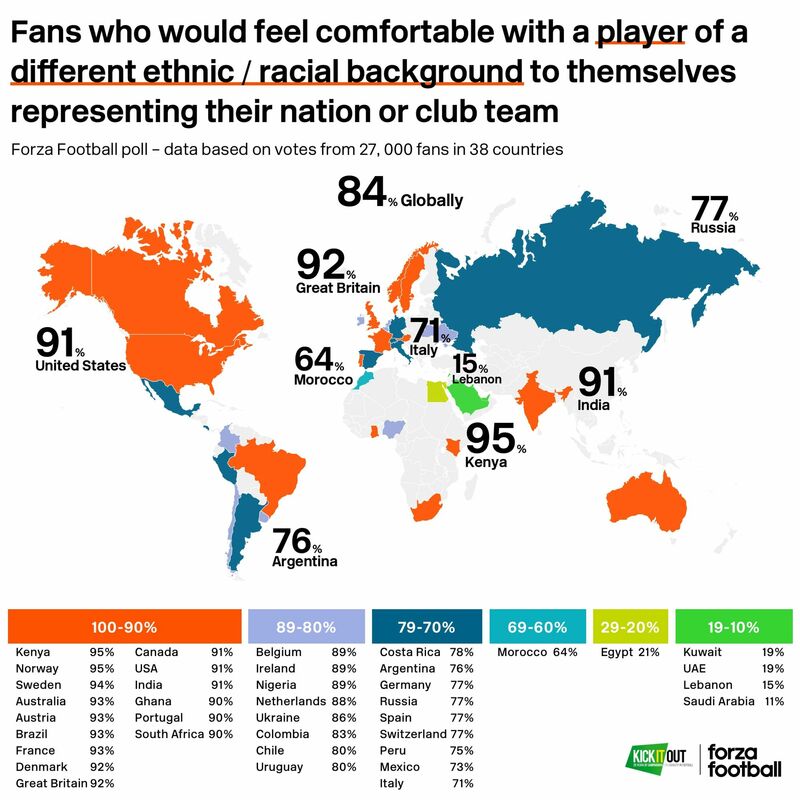 • On average, 84% of fans would feel comfortable with a player of a different ethnic/racial background than them representing their nation or club team. • Fans in Norway (95%), Sweden (94%), and Brazil (93%) feel most comfortable with a player of different ethnic / racial background representing their national or club team. Fans in Saudi Arabia (11%), Lebanon (15%), and the UAE (19%) feel least comfortable. • When it comes to the countries housing the ‘Top 5’ European leagues, 93% of French people, 92% of Brits, 77% of Germans and Spaniards, and 71% of Italians feel comfortable with a player of different ethnic / racial background representing their national or club team. This figure for the US is 91%. “The research is a timely reminder of both the progress that has been made in tackling racism in football, and the challenges that remain. “There is clear global trend towards an acceptance of the BAME, community’s central role in football, but further progress is unlikely to be made until governing bodies are bolder in their efforts to eradicate racism from every level. 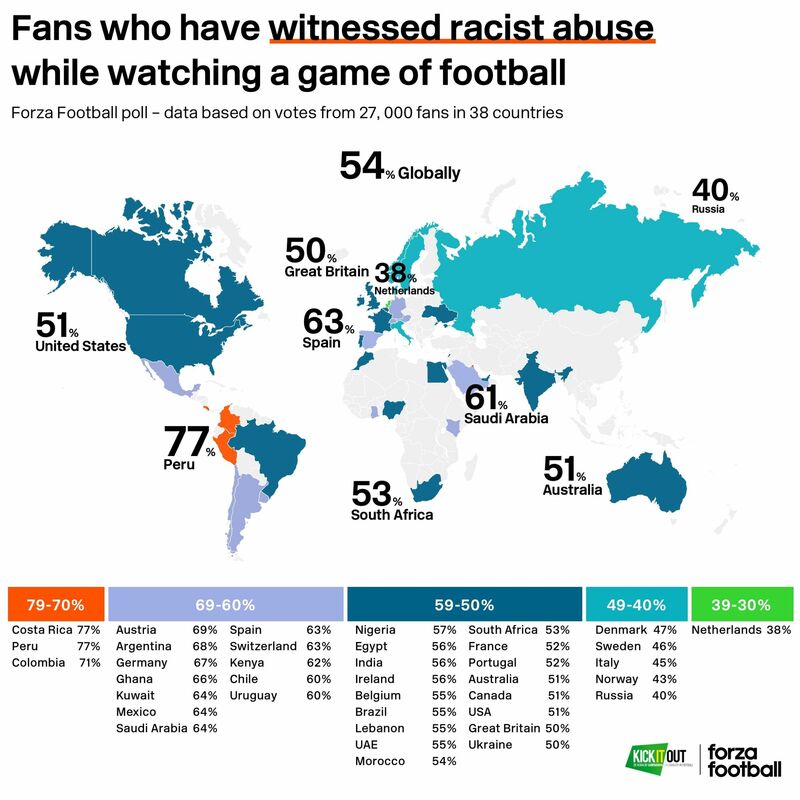 • A higher proportion of fans in Peru (77%), Costa Rica (77%), and Colombia (71%), have witnessed what they would classify as racist abuse while watching football matches, than in anywhere else in the world. Countries with the smallest proportion of fans having witnessed what they would classify as racist abuse while watching football matches are the Netherlands (38%), Russia (41%), and Norway (43%). • In the UK, 54% of fans said they would support regulations to improve opportunities for ethnic / racial minority candidates applying for jobs at football clubs (which comes following similar legislation being brought in by the FA). This figure is 64% in the US, where what is known as the 'Rooney Rule' has been implemented along these lines. • In Germany and Switzerland, following controversies this summer relating to abuse aimed at Mesut Özil and players of Albanian heritage representing the Swiss national team, nearly a quarter of fans from both countries would feel uncomfortable with a player of different ethnic / racial background representing their national or club teams (77% comfort for both). • Respondents from Ghana (83%), Colombia (77%), and Nigeria (75%) are most in favour of deducting points from teams whose fans commit racist abuse. Russian (34%), Ukrainian (42%), and Dutch (45%) fans are least in favour of such a policy.Fans in Brazil (61%), Portugal (60%), and France (44%) feel most confident they would know how to report incidents of racist abuse. Fans in the UAE (9%), Ukraine (12%), and Egypt (12%) feel least confident. Kick It Out is English football’s equality and inclusion organisation and has been at the heart of the fight against discrimination for everyone who plays, watches or walks in football. Working throughout the football, educational and community sectors to challenge discrimination, encourage inclusive practices and campaign for positive change, the organisation is funded by The Football Association (FA), the Professional Footballers’ Association (PFA), the Premier League and the English Football League. Sweden-based fan opinion platform Forza Football is one of the world’s most popular football apps, covering over 1000 leagues and tournaments globally, and attracting three million monthly active users and a stunning 1.5 million daily active users on match weekends. Forza Football has sustained this growth without any marketing or venture capital. Forza Football counts Italy, United States and the United Kingdom as its three biggest markets. The app has also been used by the likes of Transparency International, LGBT charity Stonewall, and anti-discrimination network FARE, to gauge fan opinion on serious issues, and made television history when Swedish network C More became the first ever broadcaster to use crowd-sourced fan opinions in its live reporting. Check out the amazing media coverage of the report HERE.